What are the shortsellers going to do, now that the market is burying them? They could just try an follow Al Capone's lead. After all, weren't these shortsellers gangsters, engaged in their own criminal enterprises? "You'd be sensational as an evangelist. You know this here Billy Sunday? If he can be an evangelist, why not you?" "It sounds wacky to me," Al said. "I ain't knocking you Al, I'm your friend. If they stick you in the big house you'd have lots of time to study the Bible. I'd take you on a tour, and you'd be a national hero." 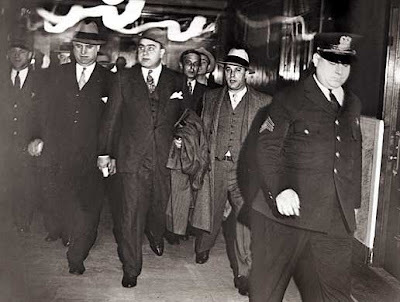 For Christ's sake," Capone protested, "I'm a national hero now. Maybe not a hero, but they know Capone everywhere--you can get a bundle on that." Kearns took another drink. "We'd make a million bucks when I took you on tour." Well, at least it was an idea. Capone left prison broken, and a captive of his own circumstances who became progressively more delusional until he died of syphilis. We did it! After wavering above and below the totally psychological level all day, the Dow closed at 10,017, with a gain of 145. Now granted, he's a journalist. But if he's already that delusional, what in the name of God is going through the mind of those who are actually short stocks? He'd probably recommend just buy more beer! Even if its just an hour after the market opens! Couldn't even get off the floor!